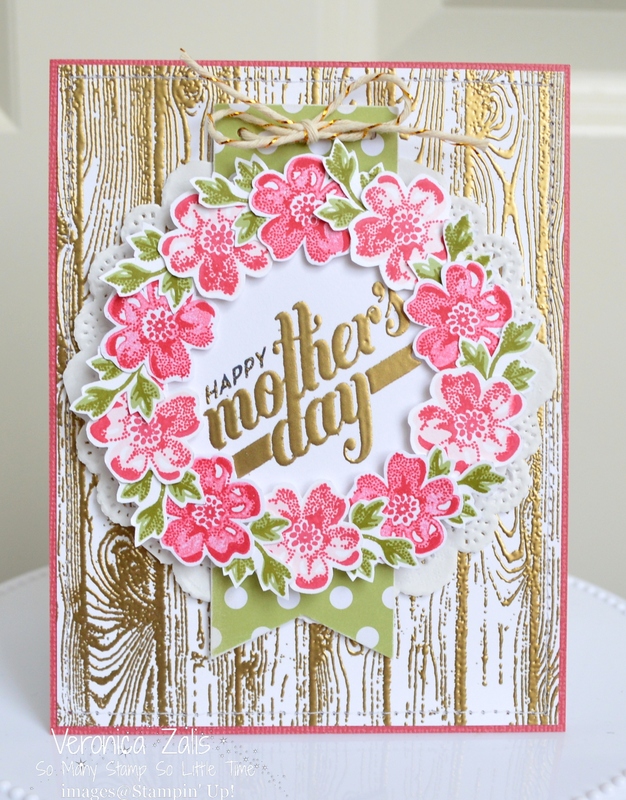 Today I am sharing a card that was a true labor of love. My card features the Stampin Up Stippled Blossoms stamp set. I started out stamping and fussy cutting 4 flowers, and four leaves, and decided I needed a few more. So I got out my Stamp-a-majig and stamped a few more of each. I tried out a few ideas, and just couldn't find a design that made me happy. I needed more flowers and leaves. After stamping, and hand cutting out a crazy amount of flowers and leaves I final picked out a design that was exactly what I was looking for. A floral wreath for Mother's Day! I stamped my flowers and leaves using Strawberry Slush, Pink Pirouette, Pear Pizazz, and Old Olive. The sentiment was stamped and embossed using a photopolymer stamp in the April Paper Pumpkin kit and Stampin Up Gold embossing powder. I used the same technique with the Hardwood background stamp and heat embossing with gold powder. I added a banner and doily from the Banner SAB kit, and used Strawberry Slush as my card base. I added a bow, and machine stitching to finish off my card. What do you think? If my Mom were still alive I know she would have loved it. Beyond Lovely!! Golden goodness in the wood grain...LOVE it!